I bought an applique pressing sheet, intending to just press the stars instead of basting them. I'm concerned that it won't work. As in, I won't be able to control the seam and keep it in the right place just using an iron. However, I'm not sure I want to sacrifice one for an experiment. (I only have enough interfacing for one more star). They are about 6". I have 10 stars made, but only one is basted. I'd really like to get this top finished and this is the last step before borders. Pressing would really speed things up. I've looked at the YouTube videos, but they are not doing the "needle turned applique" I'm thinking about doing. Anyone have experience with this that they can share? I think the only way you will know for sure is if you try. 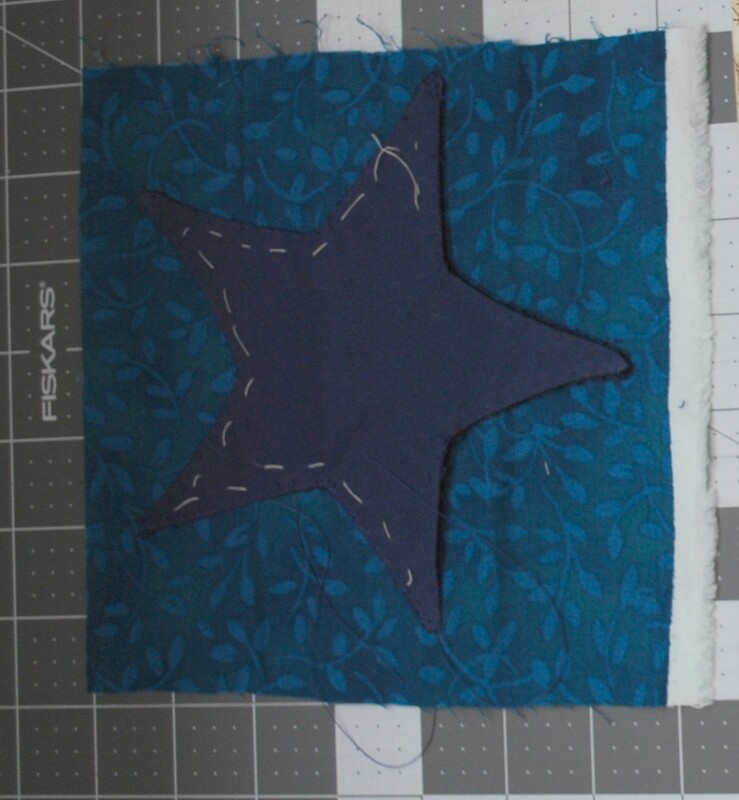 I would pick up more interfacing and see if it works on a sample star. Alternatively, you could try machine basting as it might be faster than hand basting. In my experience, the technique you are using is best for rounded shapes. I would not have used it for 5-pointed stars, mostly because I would not have the patience to turn it inside out and poke out all the points. The applique sheets add a tiny bit of "pouf", so I would not mix them with the technique you are using. I just mention them here in case you want to try a different method next time. Jenny doan of Missouri star quilt company, as well as Eleanor burns of quality let in a day, have used fusible interfacing for applique work. They, however, sewed by npmachine with a tight stitch and looser tension. Sewed, flipped out, then ironed onto background.....I have done it and it does work well......check out their videos, either on their sites or YouTube. when I do this, I iron from the back side and make sure to slightly roll the seam so that I can see it on the back side. I work all around the edges first. There will be bit "extra" on the back side, but i ease it in as I finish pressing. Thanks, Prism. I wasn't planning on doing this. 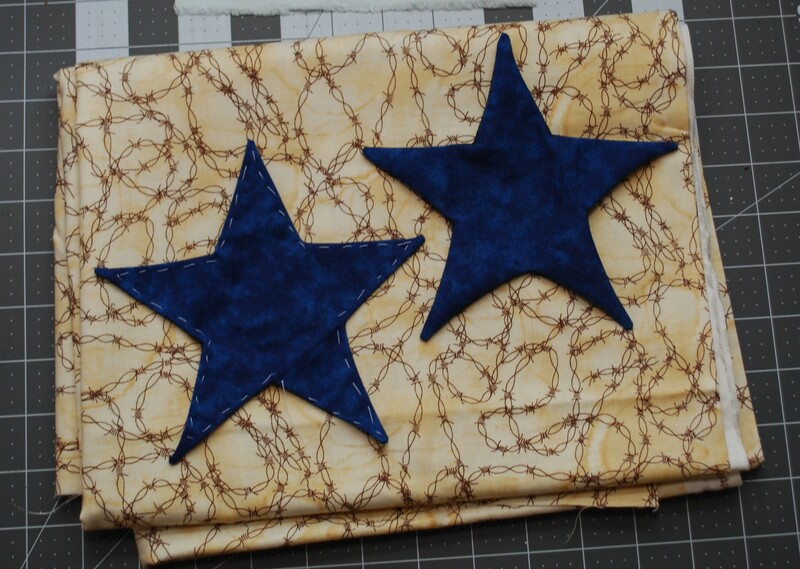 I had planned on using some "star" fabric where the original photo showed the appliqued stars, but I didn't like it. There wasn't a pattern for it, only a photo and the quilt shop is out of business. So, I'm not sure how the original quilt was made. I looked into piecing, but that didn't look too great (Leah Day). I looked into paper piecing and the look and the technique didn't appeal to me (too choppy looking). I looked into real needle turned applique and figured I'd never finish 10 of them if I got through the first one. I didn't want raw edges on the applique, so I decided on this technique. On the first ones, I used white interfacing, which didn't work, so I trashed those (should have kept them for experimenting). Then I changed the blue fabric and bought some black interfacing. The black disappears much better. These are the ones I will use on the fabric shown. I think it will look great from a galloping horse. But, I think you are right. I'll either have to sacrifice one or baste them all flat. But, won't it stick to your iron? I just recently finished a top making 5 point applique stars like yours. And because I am a glutton for punishment I made them out of flannel! As a result some of my star points are not real pointy but they are fine for the folkart look of this quilt. I used freezer paper on the back of each applique piece. Then I sprayed the front of each star with a 50/50 dilute of sta-flo starch and water and let it dry (mostly, I found the fabric a little more cooperative if it was just a wee bit damp). Then I turned the edge using the FP as a guide and something with a bit of resistance to help me with my turning and ironed the seam allowance in place. The heat of the iron dried the stach the rest of the way. The starch held the seam allowance in place wonderfully and they were pretty stiff so I bet they would behave themselves for machine stitching in place to your background fabric. I peeled off my freezer paper and hand sewed them to my base fabric. But I could not re-use my freezer paper template. Spraying with the starch compromised it too much for reuse. I've glued the edges under and then put Misty Fuse under then to hold while I stitched around. I wonder if a fabric folding pen would help? I'm just going to stitch them around the edges. The stars look better and lay flatter. I know that will work and I'm ready to finish this quilt. I have a tendency to try for perfection and then stop doing anything when I can't get there. This quilt has been hanging out for several weeks waiting on me to make the stars. I'm just going to do the best I can and finish the quilt.